For instance, here’s my Azure setup with my test site. You can see that I’ve configured multiple virtual directories. I have set my deployment settings to point to one of my Bitbucket Git repositories. That’s where Azure configuration ends. There are no per-virtual directory deployment settings. Fortunately, we can create a separate Git repository with Git’s subtree option. With the subtree option, Git allows us to create links to other repositories as sub-directories. Think of this as creating a master repository. The only thing we have to be careful of is that whatever name (prefix) we use for the subtree must match our virtual directory name. In my case, I created a repository called “azure-merge.” Since I already had my npm Express project, I used that as a starting point. The first thing that must be done from the azure-merge repository is that the other remote, for the project that I’m going to merge, must be added. I called this “express” to match my virtual directory name (see screenshot). After the remote is added, we create the subtree. This is where our prefix must match the directory name of our virtual directory. I point the subtree to the master branch of the “npm-express” repository. The last step is to push to our origin remote. git commit -m "Added subtree express"
After pushing, the express directory can be seen in our branch. In the commit view, note that the subtree shows its own commit id, so we know the subtree merge worked. 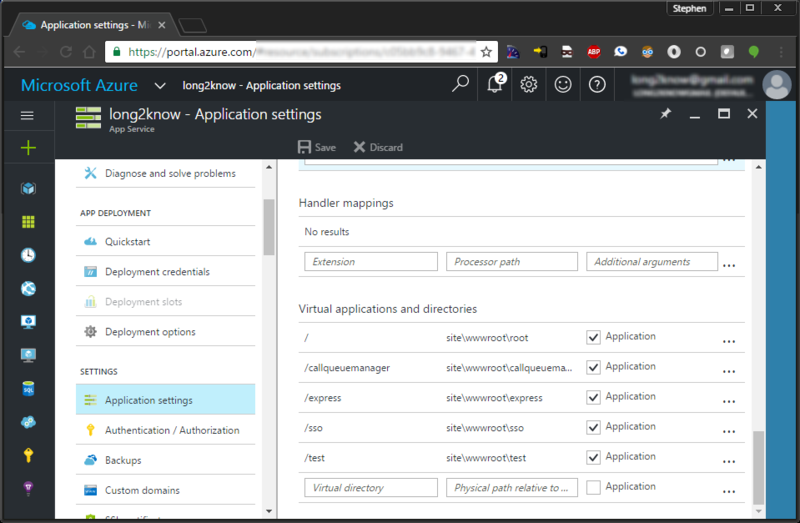 With that in place, the Azure control panel can be synced to deploy all of our virtual directories. This is a fairly good mechanism for fully utilizing virtual directories and continuous deployment from a Git source without having to jump through too many hoops. git commit -m "Updated subtree express"
git commit -m "Removing <subtree> master"
git commit -m "Adding <subtree> from release branch"